South Bend, Indiana – Joe Hand Promotions, Inc. of Feasterville, Pennsylvania, via a Kentucky intellectual property lawyer, has sued in the Northern District of Indiana alleging that Lee H. Holmes, individually and d/b/a Homer’s Restaurant, both of Peru, Indiana, unlawfully intercepted and televised the Ultimate Fighting Championship 141:Brock Lesnar v. Alistar Overeem (“the Program”). 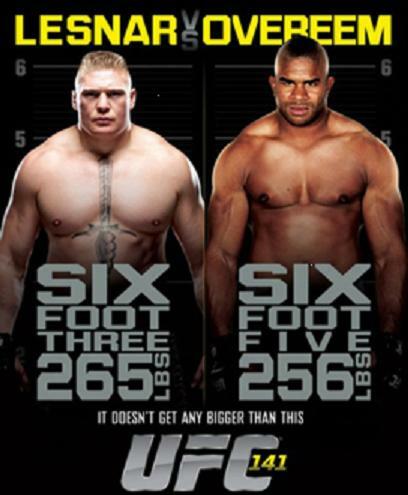 Joe Hand Promotions, a commercial distributor of sporting events, states that it was granted exclusive rights to distribute via closed-circuit telecast the Ultimate Fighting Championship (“UFC”) fight between Brock Lesnar and Alistar Overeem, which Joe Hand Promotions asserts was broadcast nationwide on December 30, 2011. In the complaint against Holmes and Homer’s Restaurant, Joe Hand Promotions has alleged such wrongful acts as interception, reception, publication, divulgence, display, exhibition, and “tortuously” [sic] converting the Program. In addition to naming the restaurant, which was not listed as a separate legal entity, Joe Hand Promotions has also sued Holmes as an individual, claiming that he had the right and ability to supervise the activities of Homer’s Restaurant. Joe Hand Promotions asserts that those activities included the unlawful interception of its UFC Program. Holmes and Homer’s Restaurant have been accused of violating 47 U.S.C. § 605 and 47 U.S.C. § 553. The complaint, filed by a Kentucky intellectual property attorney, also lists a count of conversion. Joe Hand Promotions seeks statutory damages of $110,000 for each willful violation of 47 U.S.C. § 605; $60,000 for each willful violation of 47 U.S.C. § 553; compensatory and punitive damages on the claim of conversion; costs, including costs incurred for the service of process and the investigation of potential wrongdoing; and attorney’s fees. Practice Tip #1: While on the surface this appears to be a copyright case, an allegation of interception under 47 U.S.C. § 605 is a different cause of action from copyright infringement. However, a suit alleging interception does not preclude an additional lawsuit asserting different causes of action. For example, the copyright holder can also sue for copyright infringement, which could increase damages by as much as $150,000. Practice Tip #2: Most satellite signal providers employ encryption to limit receiption to certain groups, such as paying subscribers. However, not all licenses grant equal rights. for example, if an individual as a “residential” agreement with a satellite provider, that agreement does not also give that individual the right to display the performance in a public setting like a bar or restaurant.. This complaint was filed by Charlie W. Gordon of Greene & Cooper LLP. The case was assigned to Judge Rudy Lozano and Magistrate Judge Christopher A. Nuechterleinin the Northern District of Indiana and assigned Case No. 3:13-cv-01415-RL-CAN.